^ Under Article 82: "Official language" of the Constitution of Brunei, مالای دیلی is the official language. ^ Under Article 82: "Official language" of the Constitution of Brunei, اینگیلیس دیلی is used in official documents (official documents are bilingual; Malay and English). ↑ Brunei. Ethnologue (19 February 1999). یوْخلانیلیب30 December 2013. ↑ Call to add ethnic languages as optional subject in schools. آرشیولنیب اصلی نۆسخه‌دن on 19 November 2013. یوْخلانیلیب19 November 2013. ↑ ۵٫۰ ۵٫۱ National Statistics. depd.gov.bn. یوْخلانیلیب1 July 2015. 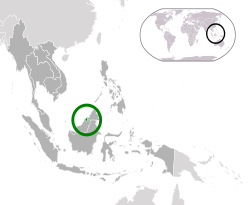 ↑ ۶٫۰ ۶٫۱ ۶٫۲ ۶٫۳ Brunei. International Monetary Fund. یوْخلانیلیب22 January 2016. ↑ 2015 Human Development Report. United Nations Development Programme (2014). یوْخلانیلیب14 December 2015. ↑ Delegation Record for .BN. IANA. یوْخلانیلیب6 November 2015. بۇ صفحه‌‌ سوْن دفعه ‏۴ دسامبر ۲۰۱۸، ‏۱۲:۱۶ تاریخینده دَییشدیریلمیشدیر.